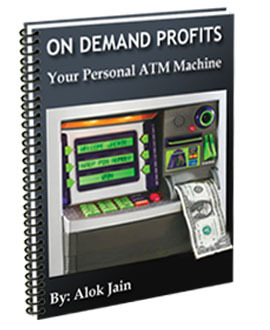 On Demand Profits by Alok Jain is an excellent introduction to making money online. Its geared toward absolute newbies as well as people who have tried Internet marketing before but failed to make any money. Jain is a well-known and respected Internet marketer who has a knack for putting marketing concepts into terms that even beginners can understand. On his website, Jain keeps mentioning a somewhat unlikely story about a secret tactic that he "stole" from his top affiliate. We doubt the story is actually entirely true, as Jain most likely developed his idea along with his affiliate, or just picked it up over the years. The important thing is that we found the technique to indeed be effective. On Demand Profits is a downloadable e-book that is well-written and professionally laid out. Its fairly concise, but very dense, with plenty of useful information. It opens up with an introduction that briefly covers online marketing and gives advice on good products to promote. Youll be walked through necessary background tasks you need to complete, such as setting up a Paypal account. It then moves on to the principal On Demand Profits technique. The actual technique itself is not completely groundbreaking, as most experienced marketers are probably aware of the method. However, its somewhat tricky to implement correctly unless you know the exact steps to follow. Fortunately, Jain covers the technique in exacting step-by-step detail, so that even beginners can become successful with this technique. You may be tempted at times to break away from the model that Jain provides, but we recommend you stick with the system meticulously, at least at the beginning. Next, youll be shown how to create an automated income stream by finding a winning formula and replicating it repeatedly. But initially, you will have to put in a few hours of work each day. The good thing is that you will not have to build your own website or have any technical skills at all. Jain goes on to give out general tips and alerts readers to common mistakes that many online marketers often make. More experienced readers will likely be aware of these pitfalls already, but beginners will likely save themselves a lot of time and aggravation by avoiding these mistakes. Finally, on demand profits shows you how to market the very same manual yourself to other buyers, giving you 100 of the profits. Its a win-win situation, you keep the entirety of the profits, while Jain builds up an email list via buying customers. This tactic is a very fast way to get sales coming in immediately. Jain leaves you with the advice to keep things in perspective and to put a plan into action instead of just endlessly reading and researching. Overall, we found the value of On Demand Profits to far exceed the small $7 price tag. Beginners will benefit the most from this guide, and having experience can even be somewhat of a hindrance, especially if you have not been successful making money online. Conventional wisdom suggests that it should be somewhat difficult to make money on the Internet. Actually, nothing could be farther from the truth. Its very easy to make money online IF you follow a winning formula. The technique offered by On Demand Profits will no doubt sound overly simplistic to some, but it does work. Will you make millions of dollars by following this guide? Absolutely not. Will you make back your seven dollars quickly? Yes, and then some. If you can comprehend this guide and follow the steps faithfully, we predict it will be difficult for you to fail. From what weve seen, theres no quicker way for a beginner to get started making money online. Considering the fact that you dont even have to pay for web hosting or a domain name, theres no cheaper way either. *new* Mailing List Profits! Master Resale Rights Included.